Sandmarks Marketing provides beautiful comprehensive destination books to the high-end hotels in three major cities on the East Coast. These hardbound resource guides give the hotel guests an overview of each city along with all that city has to offer. Our clients are the very best in dining, shopping, attractions, amusements and more who wish to represent their businesses with the highest possible impression for hotel guests eager to do business with you! Whether you are seeking a leisurely walk on the Boardwalk, shopping in downtown specialty stores or at the corporate outlets, scrumptious beach treats to fine dining, entertainment or just a peaceful morning stroll along the shore, you will find your niche in the Ocean City and Delaware Beach resort area! 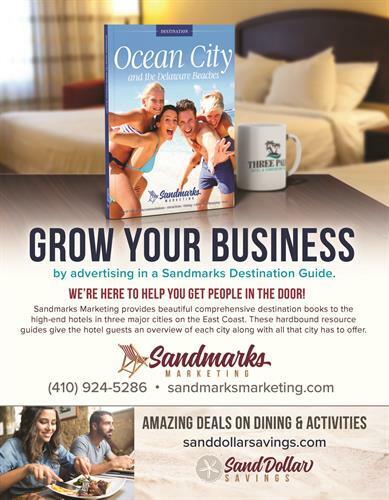 With over 7,600 of the best hotels in our distribution network, Sandmarks Destination Guide can reach over 2.8 Million potential readers annually who wish to learn more about your business and include you on their vacation to-do list!